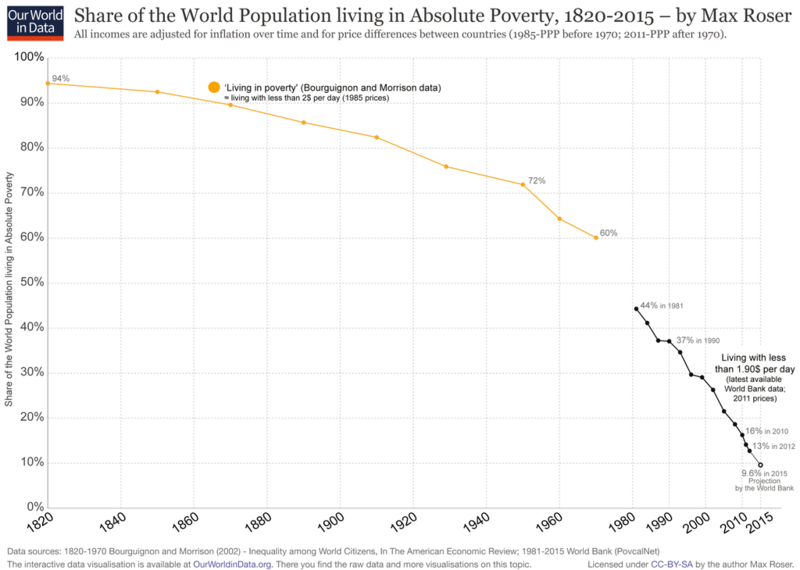 Absolute poverty is falling. What role does globalization play? The fact that global absolute poverty is falling, is spreading. It is not uncommon to tweet graphs like the one below, illustrating the good news. But why is poverty falling? Is it happening because of globalization, or perhaps despite globalization? A standard view, made famous by Dollar and Kraay (2004) is that globalization leads to growth, which leads to falling absolute poverty. When they wrote their paper, there was not enough data to systematically test the globlization-poverty relationship. That would change rapidly. Testing the link between globalization and absolute poverty using data on up to 114 countries over the period 1983-2007, Bergh and Nilsson (2014) confirmed that more globalization is indeed followed by decreasing poverty, but only a small part is explained by the growth of average income levels. 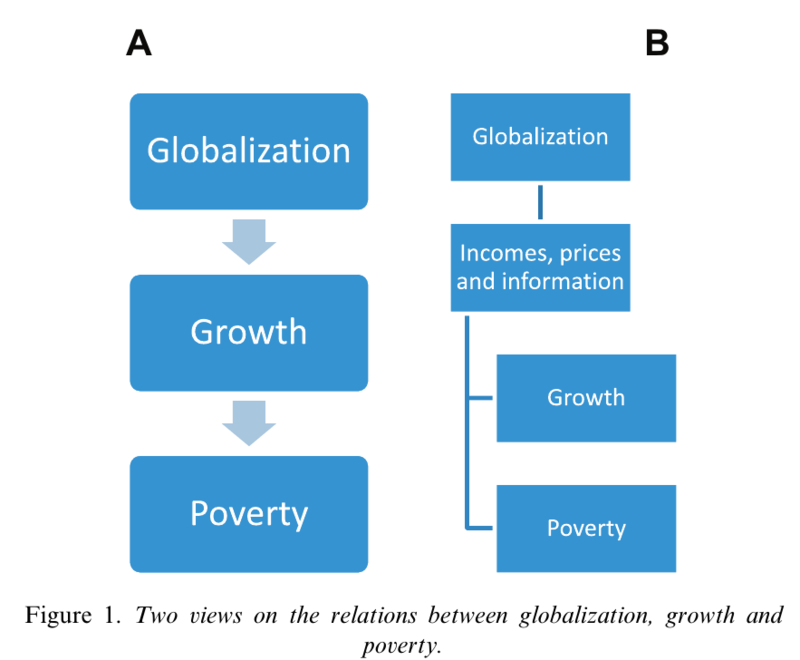 Theoretically, globalization can lead to growth without decreasing poverty or it could lead to falling poverty without increasing growth (though especially the latter is unlikely when longer time spans are considered). In all, it seems that the relationship between globalization and poverty is better described by the picture to the right below, compared to the standard view (to the left). economies and societies become more closely integrated. A nice measure often used in research is the KOF-index of globalization (Dreher et al. 2008), which allows different dimensions of globalization can be examined in detail, separating economic, social and political globalization. As it turns out, the strongest link to falling poverty are found not for economic globalization in the sense of trade flows (exports plus imports as a share of GDP), but rather from trade restrictions (such as tariffs) and information flows (eg. Internet, Radio, TV and Newspapers). Is it only about India and China? It is sometimes noted that most of the global decrease in poverty is explained by the development in China and to some extant also in India. It is true that in any population weighted description of global development, China will dominate. Those who are interested in population weighted development might as well do a case study of China. In the cross country data analysis, however, the rule is that each country is one observation. Interestingly, the world bank data separates urban china from rural china. Thus, India and China are 3 (!) of the roughly 100 countries studied. Perhaps globalization is good for the poor only when institutions are good? Theoretically, this might seem plausible. 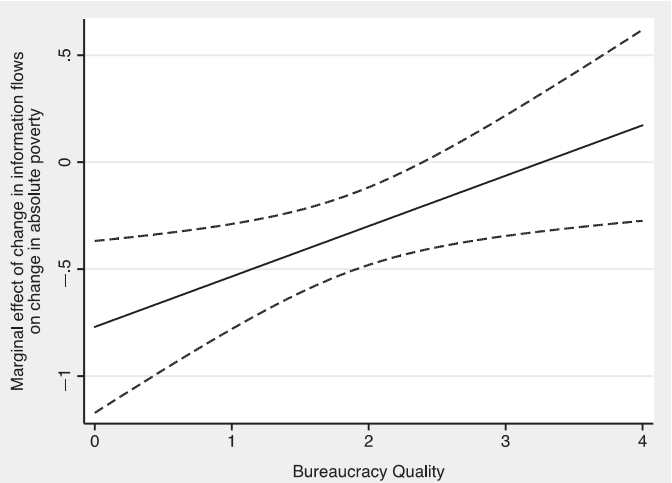 On the other hand, the marginal impact of say free information flows may well be higher where institutional quality is low. Empirically, it turns out that the pattern is exactly the opposite of what Sindzingre suggested. Using various components from the International Country Risk Guide to quantify institutions such as government stability, law and order, bureaucratic quality, corruption and democratic accountability, in combination with the data from Bergh & Nilsson (2014), we showed in a follow-up paper (Bergh, Mirkina and Nilsson 2015) that the poverty-decreasing effect of globalization is bigger in countries where institutions are worse. The graph below shows how the marginal effect of information flows on poverty varies depending on the level of bureaucratic quality. The slope looks the same for all institutional indicators, suggesting that globalization is especially important for the poor in countries with high corruption levels and inefficient public sectors. Clearly, cross-country correlations do not prove that there is a causal effect of globalization on poverty-reduction. Whether you see this as a big problem or not, depends on what question you are ultimately interested in. If you want to know what would happen if some countries randomly &apos;globalized&apos;, and other not, then you are left in the dark (and probably will be so for a long time). On the other hand, if you are interested in what happend to the countries that actually globalized in various ways and for various reasons during the 1983 to 2007 period, the result is both interesting and robust. The sample covers almost all developing countries, and the model is estimated using variation over time within countries, using 5 year averages. To put it differently, the data show rather convincingly that globalization has been good for the poor, but you should still be careful when giving policy advice to countries. This said, Bergh and Nilsson (2014) does contain two instrumental variable approaches, using lagged globalization in neighborig countries, and the duration of McDonalds presence as instruments for globalization. Still far from a randomized experiment, these approaches confirm that the variation in globalization that is imposed on countries by McDonalds entering, or by neighbouring countries becoming more open, is also negatively related to absolute poverty. Enough with this fixed-effect,2SLS nonsense! 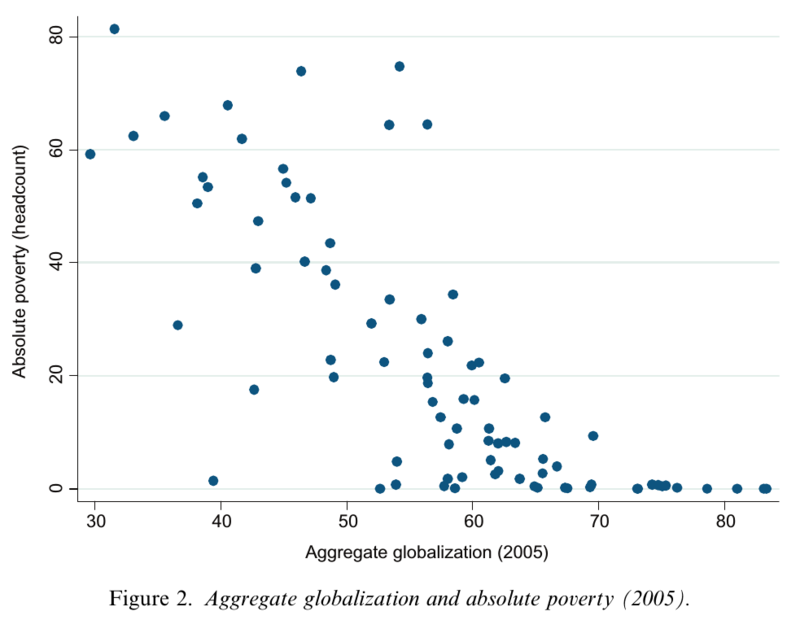 What does a scatter plot relating levels of globalization to absolute poverty rates look like? For more on the effects of globalization, see the excellent survey by Potrafke (2015). Bergh, A. and T. Nilsson (2014). "Is Globalization Reducing Absolute Poverty?" World Development 62 (0): 42-61. Bergh, A., et al. (2015). "Do the poor benefit from globalization regardless of institutional quality?" Applied Economics Letters: 1-5. Dreher, A., et al. (2008). Measuring Globalisation: Gauging Its Consequences, Springer. Dollar, D. and A. Kraay (2004). "Trade, Growth, and Poverty." The Economic Journal 114 (493): F22-F49. Sindzingre, A. (2005). "Explaining Threshold Effects of Globalization on Poverty: An Institutional Perspective." World Institute for Development Economic Research (UNU-WIDER), Working Paper RP2005:53. Potrafke, N. (2015). "The Evidence on Globalisation." The World Economy 38 (3): 509-552.